Reflecting on Our Efforts Campaigning for Cruz Thus Far. You are here: Home / *Articles of the Bound* / Reflecting on Our Efforts Campaigning for Cruz Thus Far. Mary and I flew into Orlando Florida this evening after ten intense days of campaigning for Ted Cruz in Wisconsin. A shuttle took us to our car at the park-and-go near the airport. We made the hour long drive home to Deltona. The pet/house sitter vacated earlier. I was greeted by Sammy our greyhound upon entering our front door. I loved on him a bit, petting him while talking to him; his tail wagged like crazy. It is good to be home. After settling in, I poured myself a diet soda, put on soft music, lit a candle, sat on the soda, propped my feet up on the coffee-table and reflected on the Cruz campaign and our efforts thus far to help him secure the GOP presidential nomination. Our Conservative Campaign Committee team of which I am chairman have followed the Cruz campaign state-to-state, independently providing boots-on-the-ground, implementing various get-out-the-vote-for-Cruz initiatives. We endorsed Cruz early in the campaign season. 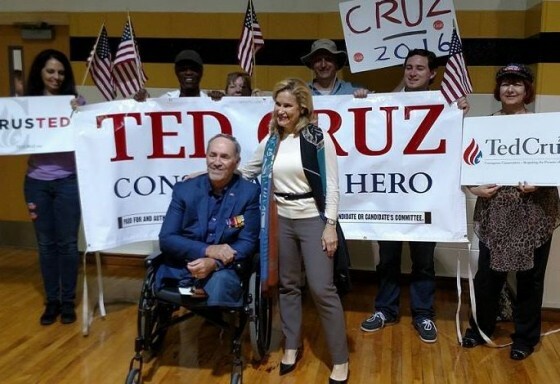 We had a banner made which reads, “Ted Cruz: Conservative Hero.” We have displayed that banner at Cruz rallies and on busy street corners in numerous cities in practically every state primary and caucus. For me to list all the spectacular moments on the campaign trail would make for a very long article. However, for some reason, a memory of Cruz’s wife Heidi sticks out in my brain. It kind of epitomizes the tone/vibe of the Cruz campaign that our CCC team has witnessed state-to-state. It was a small event, about 150 people, in Fayetteville North Carolina. Ted was not there. Heidi was the keynote speaker. One of the points Heidi made is Ted is so relaxed and unstressed on the campaign trail. At the end of the event, our team met Heidi. She thanked us for our efforts and posed for a picture in front of our banner. Our team was piled in the SUV leaving the event. I saw Heidi and her staffers casually walking to their cars. Heidi had a big smile on her face, chatting with people, seemingly without a care in the world. Her demeanor and body language spoke to me in a way I can not explain. Ted and Heidi are “for real” folks. What you see is what you get. I believe and trust them. Again, I felt a genuineness in the way Eleanor, Heidi and Ted expressed their love and admiration for each other; inspiring and quite moving. I whispered to a CCC team member, “If their responses are scripted, Ted, Heidi and Eleanor deserve Academy Awards.” The Cruz family are plain old-fashion good people folks. Cruz winning Wisconsin was particularly thrilling. Our CCC team was boots-on-the-ground, but it took grassroots support from patriots across America to propel Cruz to victory. Thanks patriots. I love it when we work together to get-r-done! Clearly, a shift towards Cruz is underway. In keeping with the old saying, the cream really does rise to the top. I long suspected that Cruz would emerge as the obvious best GOP presidential candidate once the field narrowed down to a two man race. Yes, I realize what’s his name, the third guy, is still in the race. Recent polling confirms that Cruz can beat Hillary in the general. http://bit.ly/1IQYXvV The swiftly growing Cruz-mania has given me new hope regarding the character and soul of my country. Mainstream media, Democrats and the Left have convinced the GOP establishment and many Americans that we are now a Leftist country. The Left’s bogus narrative is a majority of Americans are repulsed by Cruz’s brand of Conservatism rooted in traditional principles and values which have made America great and exceptional.